It was in my friends’ kitchen in Wainfleet where I was first introduced to an heirloom tomato, it was a giant green zebra tomato to be exact. I clearly remember how unique it was to me; juicy, with light green stripes and a flavor new to my palette. At the time I was unaware that it was an “heirloom” tomato or that it was called a zebra tomato I just knew it was different, and delicious, and I wanted more. Around that time I had just recently begun saving my own seeds and after that dinner I couldn’t help but take a few seeds home to try my luck with them; Shortly after that night I booked a flight to go back to Venezuela to be with my husband and I was eager to try our luck at planting the seeds there. Once I was in Venezuela it was through some online research that I was able to find the source of the seeds. They were from Tree and Twig Farm; a farm specializing in heirloom vegetables located close to my friends home, in the town of Wellandport to be exact. While down south we had great success with our green zebra seeds and enjoyed sharing the lovely green tomatoes with friends and family; and since that time we have returned back to Niagara and continue to grow our own small vegetable garden to share with those close to us. I knew that upon our return I wanted to connect with Tree and Twig, so that I did. Being back in Niagara I was fortunate to attend a seeding workshop on the Tree and Twig Farm. It was here where I absorbed an enormous amount of new knowledge about growing and also went home with an awesome new selection of heirloom varieties. Since that first green zebra tomato my love of heirlooms has continue to flourish and I owe much of that to Tree and Twig. We are greatly inspired by Tree and Twigs outreach in the community at events such as Veg Fest and their educational workshops that they run on the farm. It is for this reason and many others that we reached out to find out more about Linda’s work and passion. Could you explain to us a little about your background and how it has brought you to your current work with Tree and Twig? 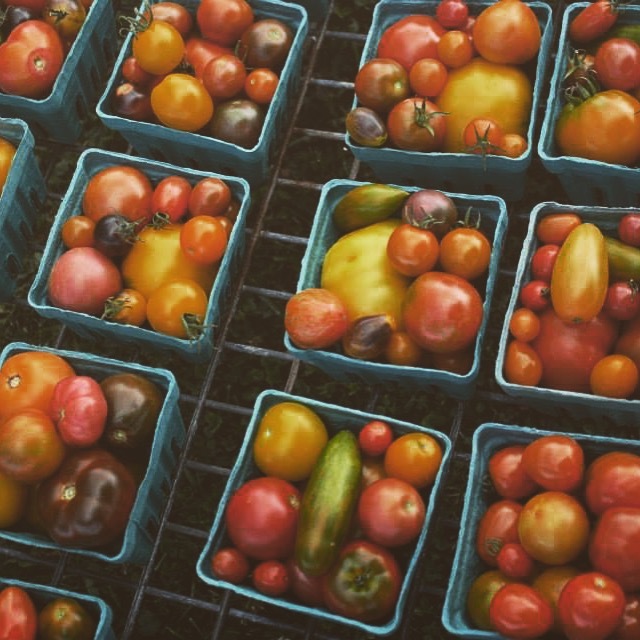 When were you first introduced to the concept of farming and more specifically growing heirlooms? I grew up on a farm in Flamborough-north of here and now considered to fall within the limits of the City of Hamilton. I loved it. My parents were very hard workers. They were both teachers, but also farmers. I drew inspiration from both of them and still do even though they have passed on. My mom had very large veg gardens and we sold asparagus and raspberries at a roadside stand along HWY 6. She grew all kinds of things 45 years ago that people consider unusual…tomatillos, ground cherries, Brandywine tomatoes, etc. Heirlooms are very familiar to me, I grew up with them. When my parents felt it was time to sell the farm, it tore out my heart but I understood. I remember standing in the fields for the last time and knowing that I needed to get in the country. At the time I was a social worker and had a home in Welland. I knew that was not what I was meant to do. How important do you feel your location(The Niagara Region) is to your current work with Tree & Twig? How do you feel the community has welcomed the idea of heirloom vegetables? I am happy to be in Niagara, but sometimes wish my soil was a bit easier to work-I have clay based soil, but have worked hard over the years to improve it. When I began doing this 18 years ago, organic and heirloom were a hard sell. We’ve come a long way. I can see that in terms of the increasing interest in CSA’s in Niagara and the relative abundance of them now in the area. I was the only one for many years. I can also see it with regards to my seedling and seed sales and the great interest in Seedy Saturday events. It is fantastic that people are interesting in gardening more and in growing these vegetables in their own gardens. And of course in saving seed and passing it along. We are aware that your run workshops such Sowing Seeds and Growing Unusual Edibles, when did you begin to do this type of outreach and why? I have been offering the workshops for about 4 years I believe. I began to do them because people had so many questions about how to grow their own food. It seemed like a natural thing to do. The workshops have been very popular so I guess I was right. I really enjoy leading them and have met some wonderful people doing so, some inspirational people. What would be your biggest tips for first time vegetable gardeners that you wish someone had told you? 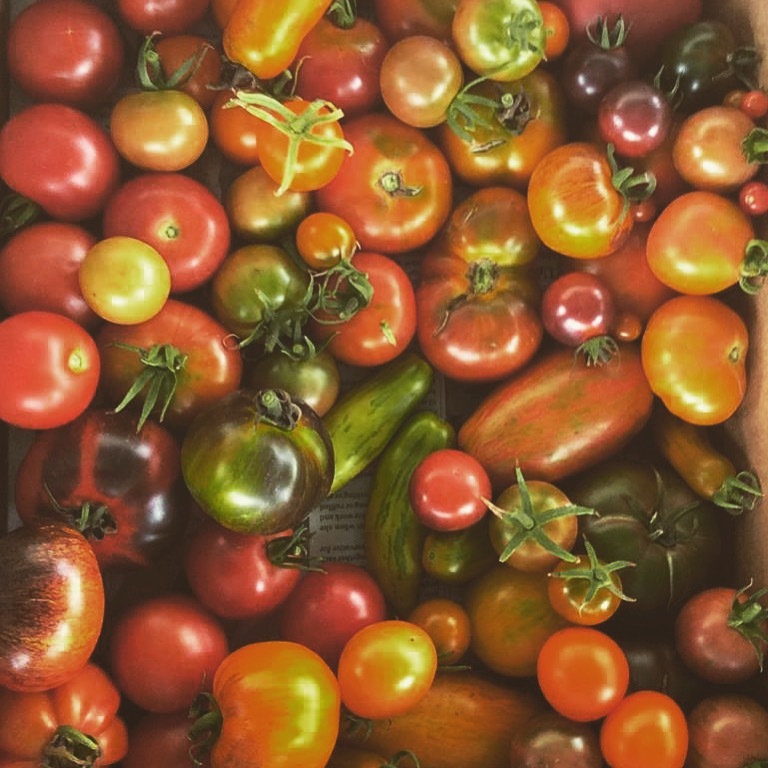 Do you have any specific tips for those who wish to grow heirlooms? My biggest tip for beginner gardeners would be to just do it, but do it small. Many people are intimidated by the thought of gardening and back off before they even begin. But start small to get a good feel for what you can handle. Seeds are meant to grow and they will, sometimes even in challenging circumstances. I also think that it is a good idea to read a good gardening book for some tips…but you will learn so much just by doing. You will become the expert in your own garden, which is as it should be. 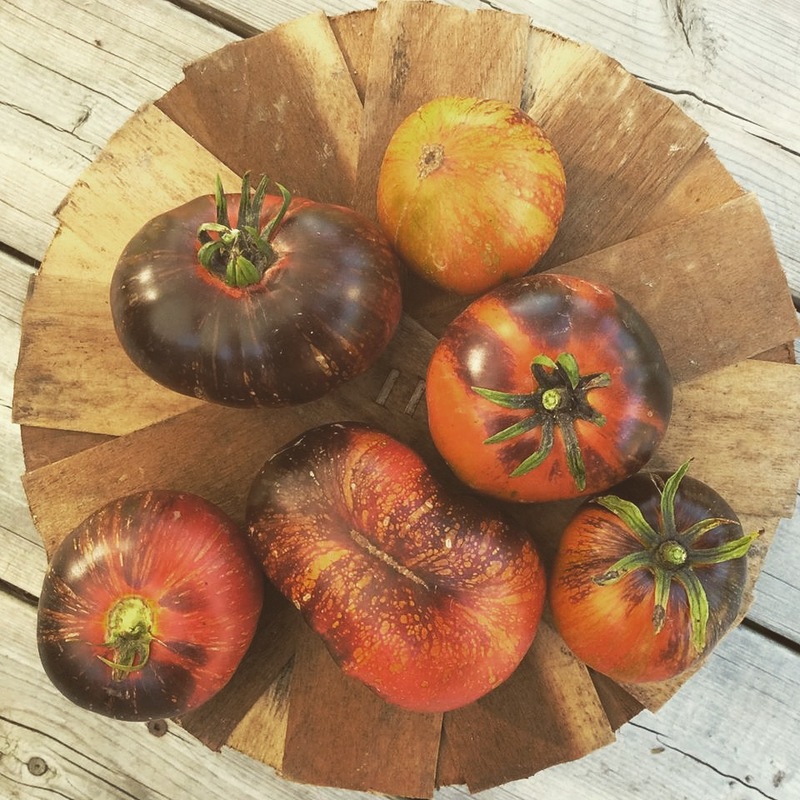 Growing heirlooms opens you up to a whole new world of tastes, colours, sizes and shapes. It is exciting! And saving your own seed from your garden gives you a wonderful feeling of accomplishment. But heirlooms may not be as disease resistant as some hybrids which are sometimes bred to have particular resistance to disease. This I find is especially true with tomatoes and cucurbits. But this drawback pales in comparison to the benefits of growing (and eating!) heirlooms. 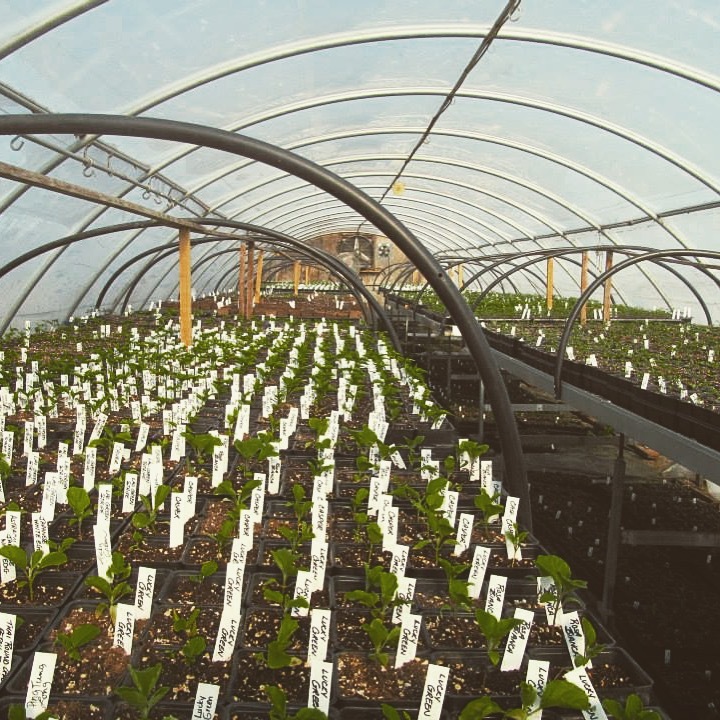 I know that farming and gardening is a constant learning and “growing” process so do you have any new and exciting projects you would like to share with us? I am still contemplating my plans for 2016. I am looking at scaling a few things back. I will still offer the spring workshops and anticipate organizing another Seedy Saturday event. 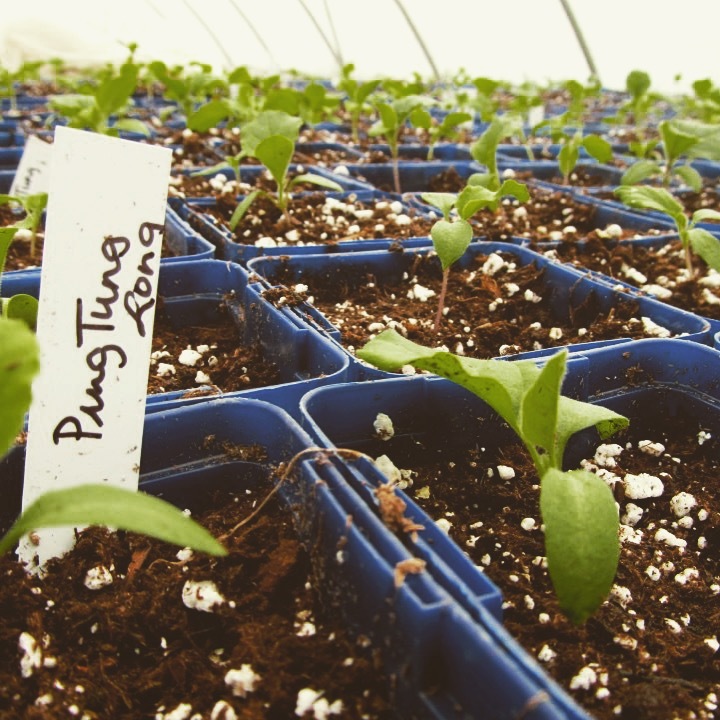 The spring seedling sales have become the biggest part of my business and will carry on for many more years. But I am constantly considering how to free up a bit more time for my family, friends, myself and other interests that I have. It is exciting for me to think about how my business will look in 2016…there will be some minor changes. I agree with her advice to start small. I started too large with my gardens and then decide to give up on them in frustration. Even my container gardening was a bit frustrating trying to keep them.hydrated and enough sun.